This morning I’m paying extra attention to my packing as I expect a tortuous track ahead. The Creb track is not an easy one. 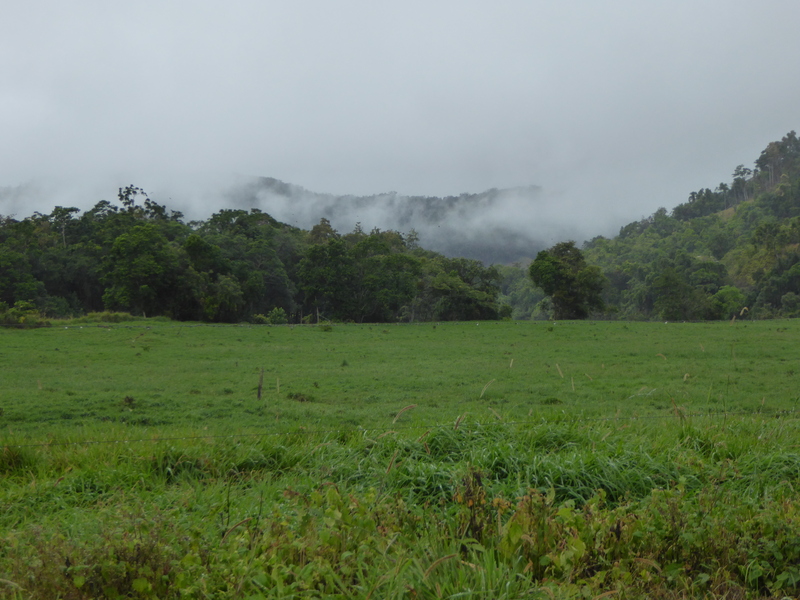 It has some steep hills, and it’s very remote. 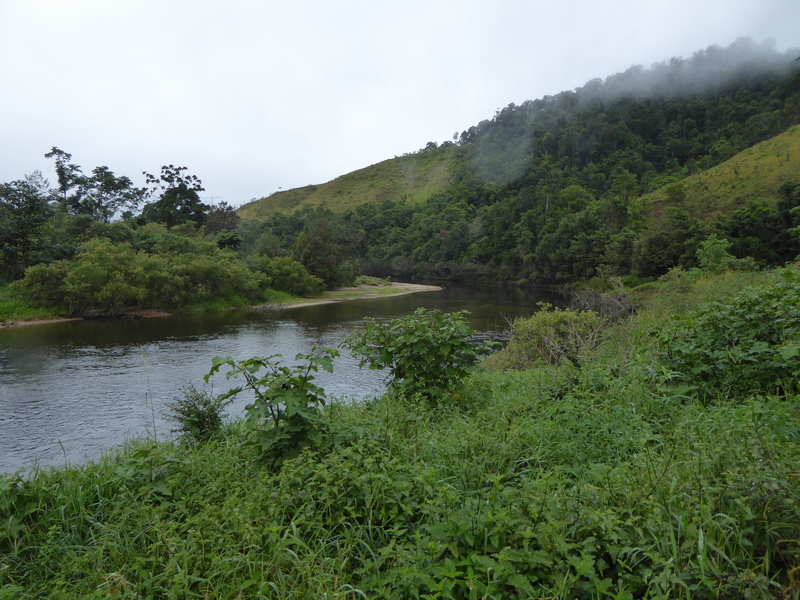 The first challenge is to cross the Daintree River, which is worrying me more than I would like it to. I chat with a lady to see if by any chance she was going to the Creb track. She says no but warns me that a 4 metre long crocodile was spotted this morning next to the campsite. Rumour or fact, it’s not helping me relax. I decide to speak to the owners of the Caravan park. 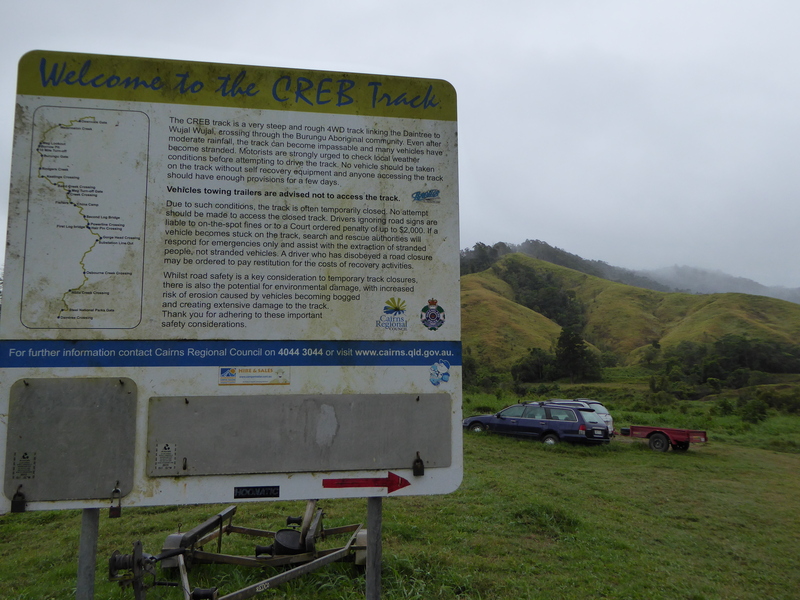 They are concerned that the Creb track will be very slippery because of all the rain that is now falling, and likely to continue. They tell me that it will be like walking on ice. Even a very well equipped 4wd would struggle. 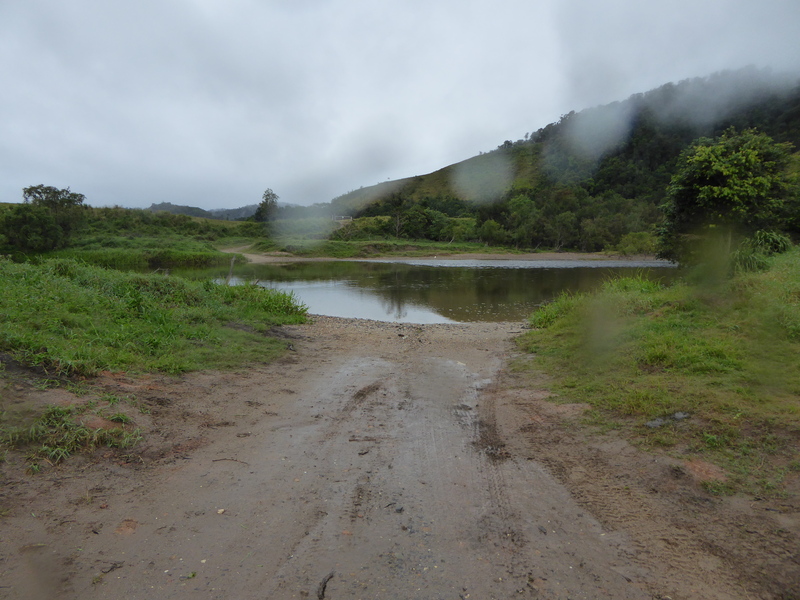 The other concern they raise is that if no 4wd is going to go that way, I can’t get a lift across the river. In other words I would have to cross by foot amid the crocodiles. It’s a pure game of luck. Most likely I would be fine. But I don’t want to be the first person this year to be taken. 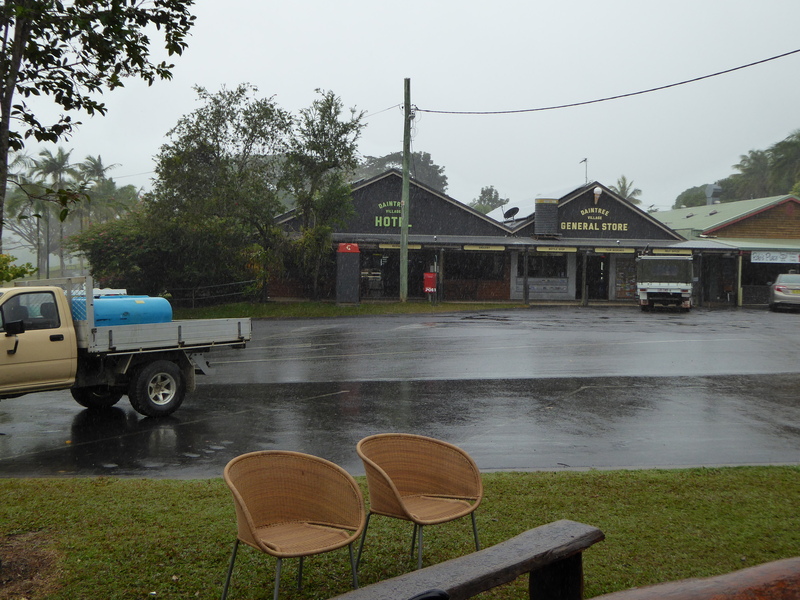 It has been raining most of the day today, and now it is pouring down. I’m convinced now that the Creb track is a no go. I can’t imagine myself crawling on the hills and dragging my bike while getting soaked through. There will be very little help out there if I get in trouble. I’m used to the remoteness but I’ve recently tried to climb a hill on that clay, and it’s nearly impossible. Being experienced or fit would not make any difference. It’s just not meant for a heavy bike. I decide to go have a look at the crossing and take some pictures. 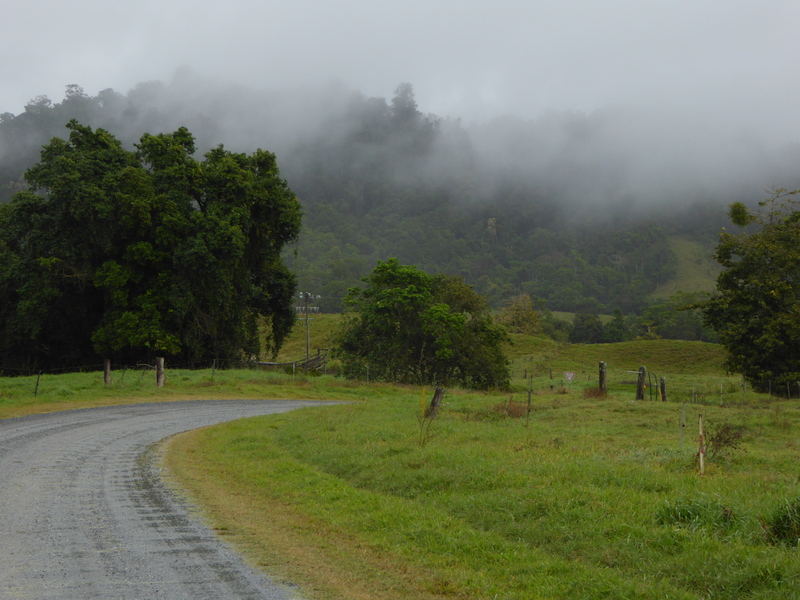 It’s a 10km ride along the river in the rain on a good gravel road. I try to spot crocodiles on the way but I’m never really lucky with those things. At the crossing, I approach but keep some good distance from the water’s edge. They are very good at hiding and can swim at 40km/hour for 200m. If one caught me, I’d have it’s one tonne jaw pressure around me and flipping me, breaking my bones and drowning me. It might wait a little bit until I’m slightly rotten before swallowing me. Just easier to chew I reckon. 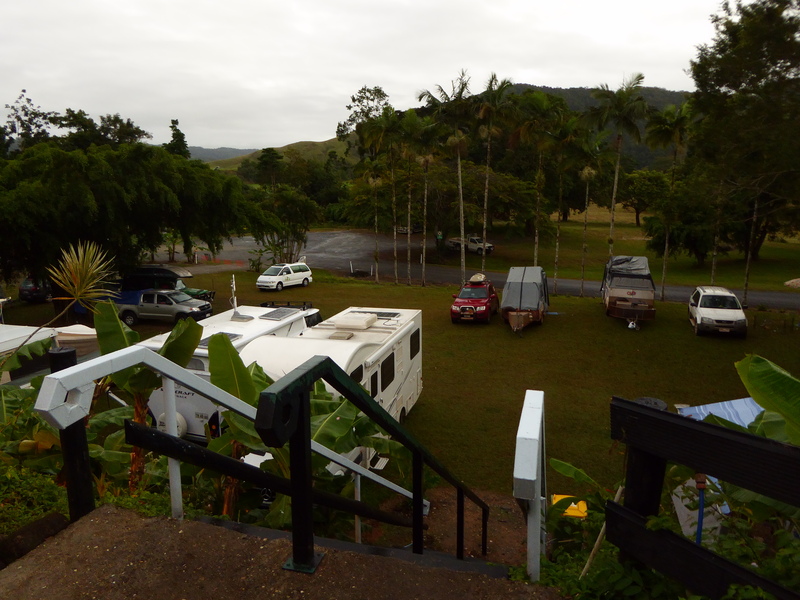 I head back to the Caravan park, happy that I’ve at least been that far and took some pictures. It’s a beautiful place really. The wildlife and the scenery continue to amaze me, but the humidity is hard to bear when you can’t easily change clothes and have a shower. 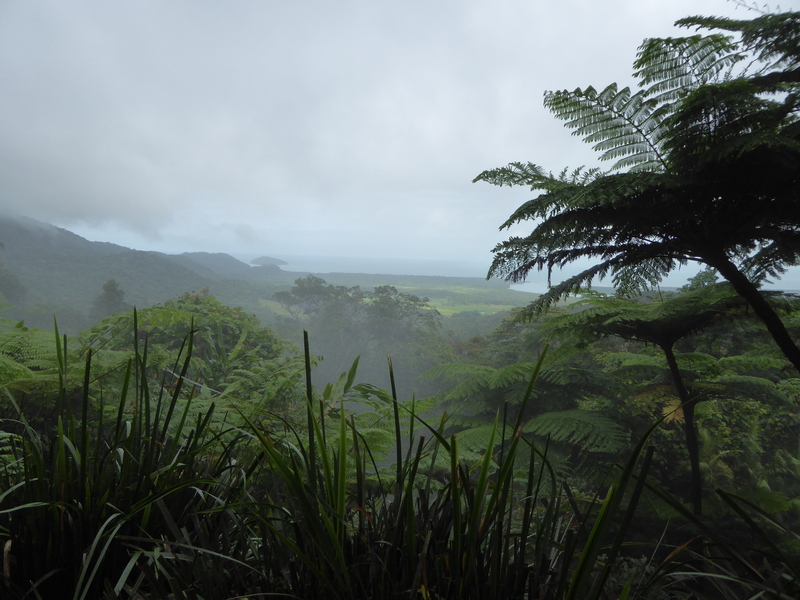 I don’t think I have the mental strength to go back in the bush and suffer. 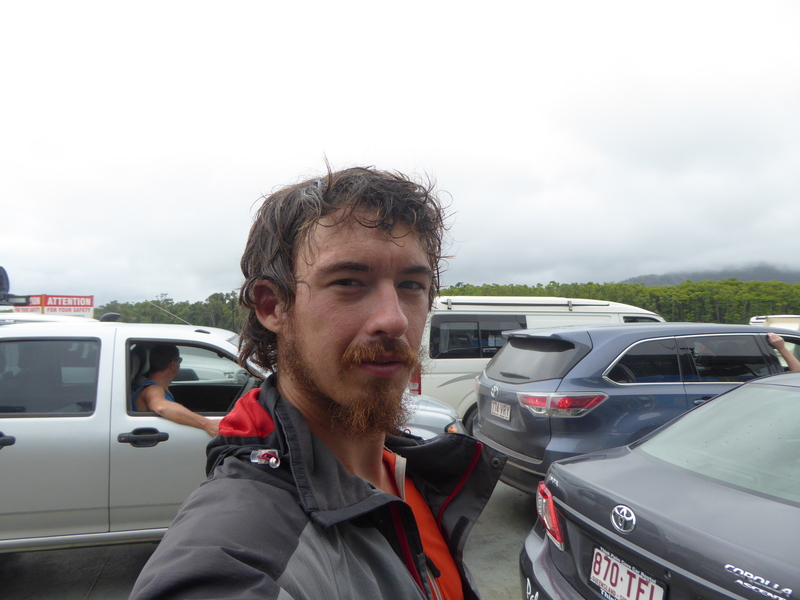 I’ve had it hard recently and I’m a little bit afraid of being alone in the bush at the moment. I’d love a support team actually. Then I would go. If it’s easy to pull the pin, then it’s fun. Also I need to remember that I have two dodgy wheels, with one missing two spokes and some rim damage. 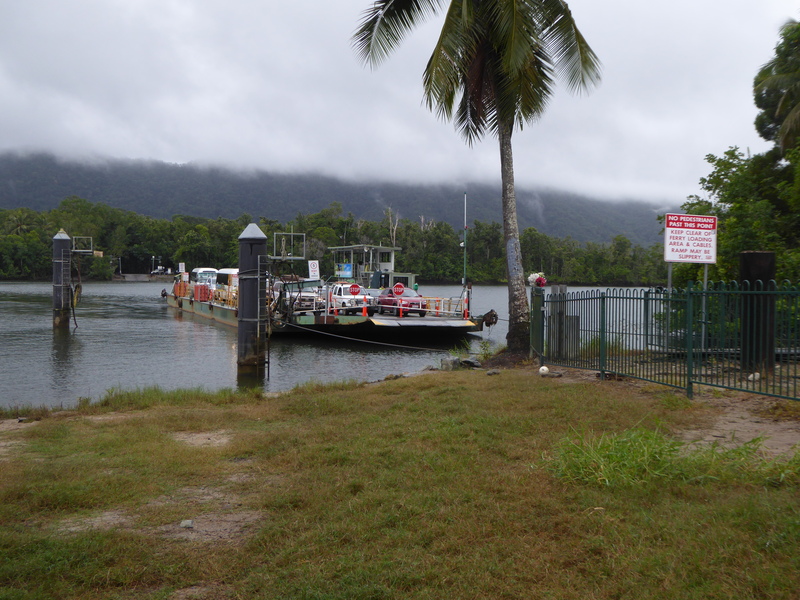 After a few phone calls, I leave Daintree Village and ride back to the turn off for the ferry crossing. On the way I’m very tempted to go on a crocodile spotting cruise. I have done them years ago and I reckon they are amazing things to look at. I just don’t think I have the time and there are too many people everywhere. It’s busy time. In the back of my mind, I know I have seven days left before I fly out for holidays to France. That should be just enough to get to Cooktown and back to Cairns, if I don’t have any more problems. Mechanical concerns are the main thing. I pay the $1 fee to cross the river on the barge and keep going north. The cars come by load with the ferry. 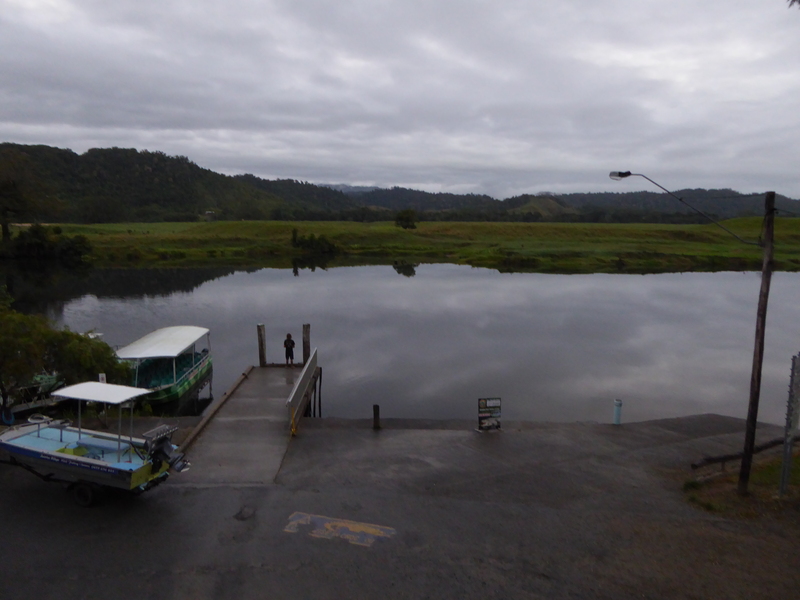 So in between two ferry crossings the road is quiet. When the cars start to come I pull over. 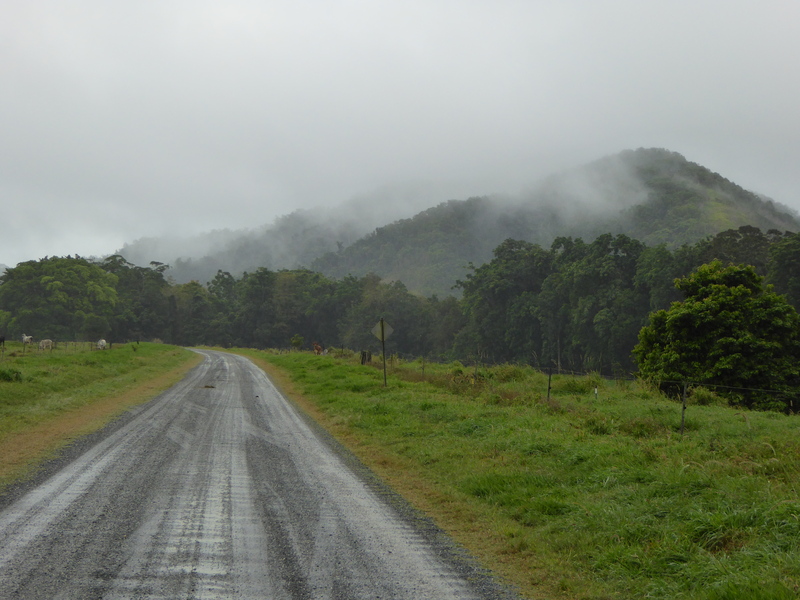 It’s a very narrow and windy road, cut through the rainforest. It’s an amazing place but would have caused a fair bit of environmental damage when it was built. The discover centre, I remember, is a fantastic thing to see. 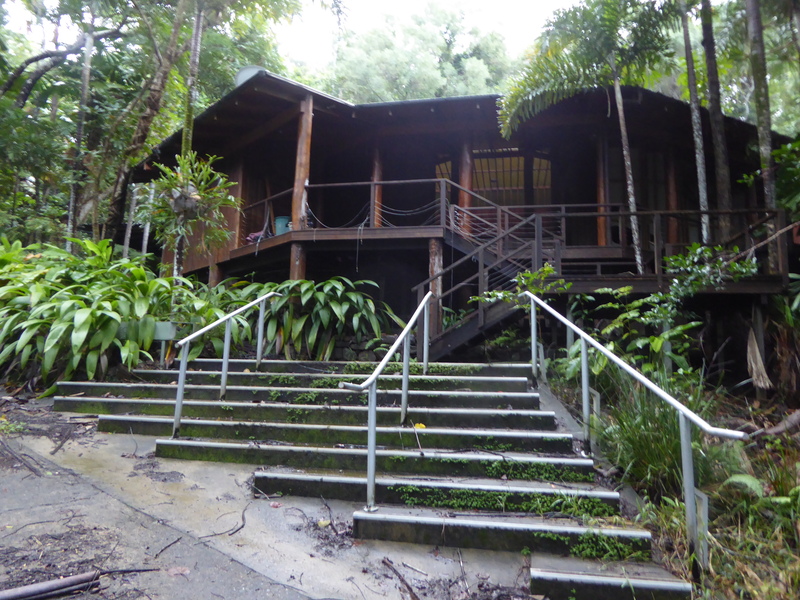 Walking on boards in the rainforest, on the different levels, is the perfect way to explore without affecting the fragile ecosystem. But once again, I’m thinking I don’t have enough time to do that. Maybe on the way back if I take the same road. 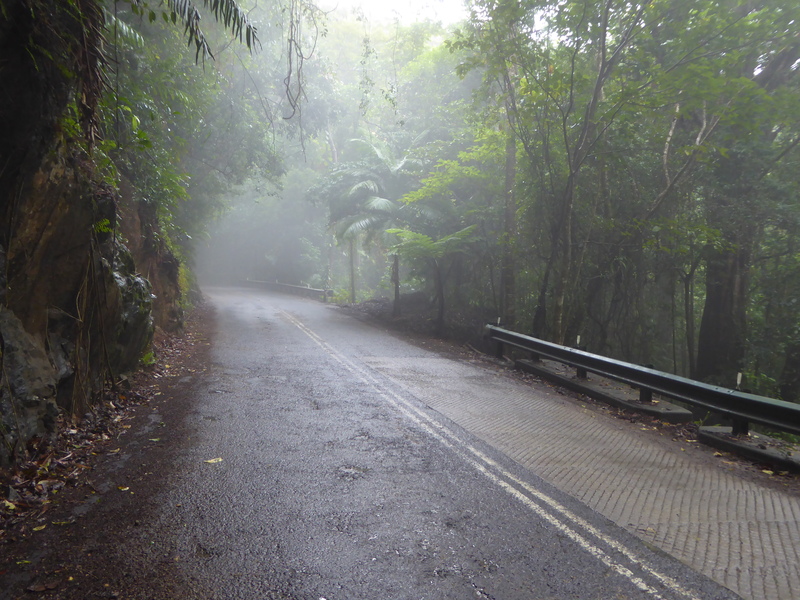 There are two climbs on the way to Cape Tribulation. It’s hard work but still easy compared to bush riding. Unfortunately though my front wheel starts to make some noise. The wheel is clicking and it’s getting louder and more frequent. Any noise on a bike is not good and must be treated very seriously. It could be nothing or it could be a sign of big troubles. I can’t find what’s wrong yet but it has something to do with the spokes I replaced recently. While I check my front wheel, someone driving past tells me that I can sleep for free in the abandoned resort right next to the road. Nobody is supposed to stay there but I can get a free cabin. I explain though that I would like to get Internet. I need it actually to do a bit of research about my wheel. I take a look at the resort though. It’s really creepy with broken windows and fallen trees. 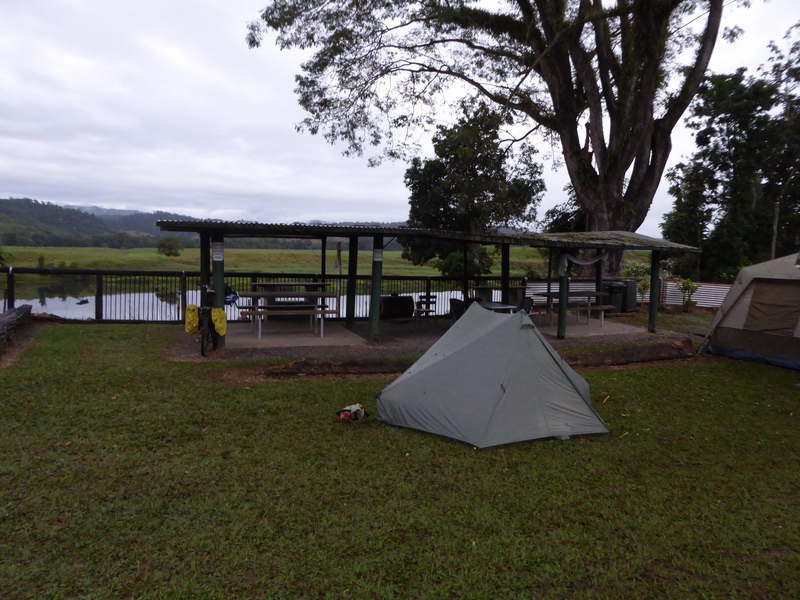 A campground is only $10 or $15 and will definitely offer the basic facilities. Not sure what the old resort has to offer, it would be an interesting experience though. 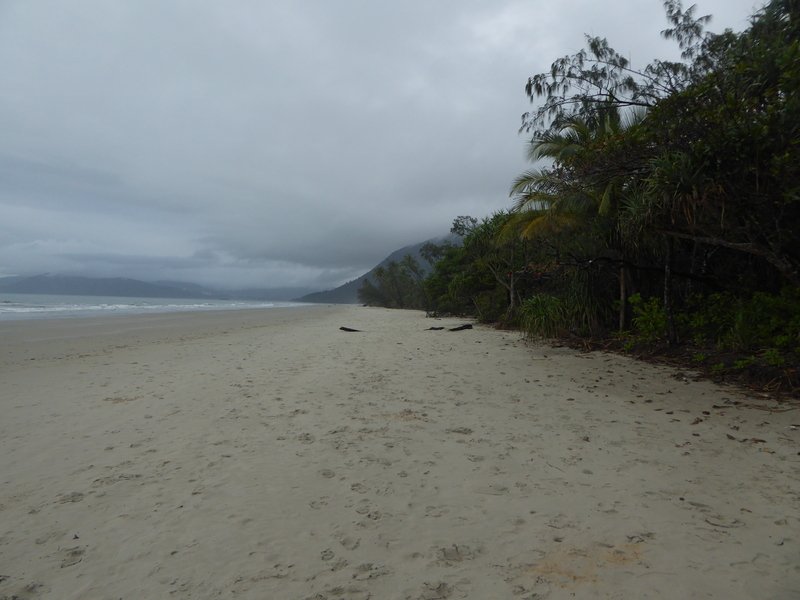 I make it to Cape Tribulation just before dark, and check out a few places until I find one that has internet. One of the backpackers looked very nice and I think I deserved an indulgent evening to pre celebrate the end of my trip. But the staff can’t find the remaining keys of the dorms and the managers have gone, so I move on. The campground I stay at has a bar. It’s really hard to believe this is still camping. It is still very wet though, and a bit of a struggle to find a spot for my tent. After a beer and a pizza at the bar, finally indulging myself, I check out the beach. They’re having a movie night there tonight. It’s a great setup and it’s nice to see an independent documentary rather than an USA blockbuster. Although I’m too tired and still hungry so I spend the rest of the evening in the camp kitchen.